Observation - Caterpillar, Mae Hong Son, North West Thailand - Global. 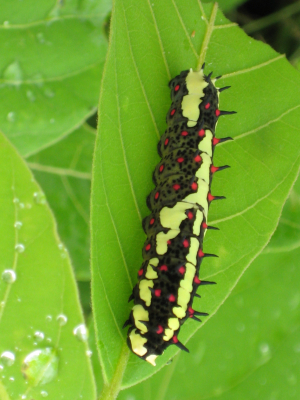 Description: Can anyone identify this amazing caterpillar? I found it on a bush at the side of the road - I've no idea what the bush was I'm afraid. It is about the length of a man's little finger. It is certainly not interested in camouflage. Can anyone identify this amazing caterpillar? I found it on a bush at the side of the road - I've no idea what the bush was I'm afraid. It is about the length of a man's little finger. It is certainly not interested in camouflage.